​We videochat, and would be thrilled to do a face-to-face. 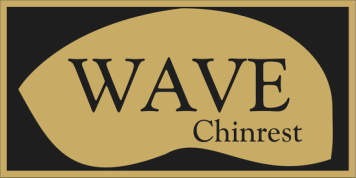 wavechinrest@yahoo.com to schedule an appointment. ﻿﻿When we play, we want to keep the head in its balance point atop the neck vertebrae, which is actually quite forward in the neck, right in front of the ears and right behind the eyes. With the head in this position, we can simply spin the head and the muscles in the neck, chest, shoulders, and back can remain relaxed. ​If the head is out of position, off of its balance point, these muscles must tighten in order to hold the head in its position. ​Some of these same muscles also move the arms. The ensuing tug-of-war between these two groups of muscles can result in pain, damage, and restricted range of motion. The lower bouts of the instrument form an arc going in one direction. The player's neck forms an arc going in the opposite direction, with one point of contact in between. forcing the player to crane their neck over to the left in order to gain sufficient contact with the chinrest in order to balance the instrument. ​the chinrest came back to meet the chin? ​and the head could maintain its natural balance atop the neck bones, allowing for proper spinal alignment, full range of arm motion, and decreased pain and damage.